​Was Francis, Viscount Lovel buried in All Hallows, church in 1487? Francis, Viscount Lovel was a close colleague of Richard III. After Henry VII defeated Richard at the Battle of Bosworth, Lovel played a major part in revolts against him. Together with John, Earl of Lincoln, he led an army that was defeated by Henry at the Battle of East Stoke about 14km (9 miles) from Gedling on June 16th 1487. After the battle Lovel was never heard of again and several explanations as to what had happened to him appeared over the next few years although there is little evidence to support any of them. Reports of the discovery of human remains at Lovel’s former home in 1708 gave rise to speculation that he had died in some secret hiding place. 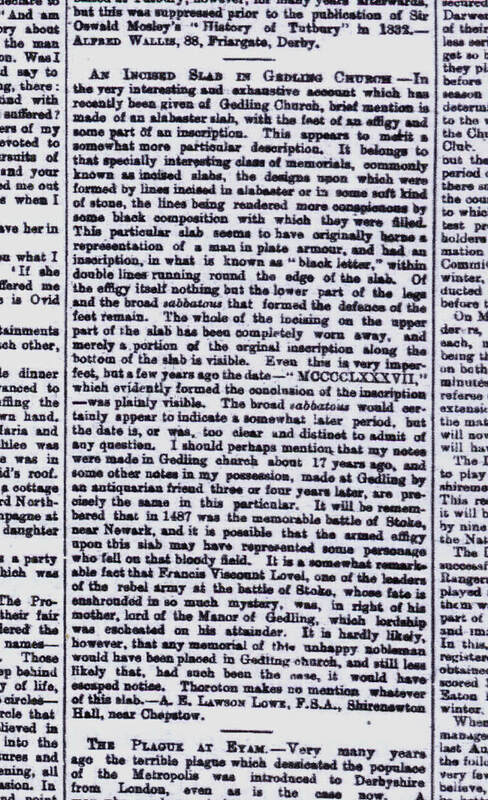 The evidence that Lovel was buried at Gedling comes from a letter written by A. E. Lawson Lowe, a Fellow of the Society of Antiquaries to the Nottinghamshire Guardian on January 26th 1883 in which he described an incised alabaster slab he saw when he visited the church in 1866. He says that the slab showed the feet of a man wearing armour and the date 1487 so he speculated that it may be Lovel’s burial place. Dr. Maggie Clamp of the Richard III Society. ​Twenty-four Reflectance Transformation Imaging (rti) images were produced and can be downloaded together with information on how to examine them. ​For further information and instructions of how to use the rti Click here. The files may be downloaded from the documents page, click here to access them. The documents page is below the Frances Lovel page in the menu.